Dining in the sky at Quinta do Lago promises to be nothing like an in-flight meal! In fact you can expect exceptional cuisine high above Quinta do Lago’s pictue-perfect lake and the beautiful Ria Formosa - a real 'one-off' not to be missed! Enjoy breakfast, lunch or a full gourmet dinner. Or indulge in a glass of champagne or a few delicious cocktails, 50 metres up in the Algarve sky. Healthy Brekkie: 45mins of Yoga + 45mins of Breakfast in the Sky - €70 per person – 44 seats available in 2 flights. Champagne in the Sky: Enjoy a glass of Champagne before your lunch (30mins) - €30 per person – 44 seats available in 2 flights. Cocktails in the Sky: Three cocktails (2 with alcohol and 1 without) and food pairing (amuses bouche / finger food from Bovino Steakhouse & The Shack) - €100 per person – 44 seats available in 2 flights. Sunset in the Sky: Three Cocktails (2 with alcohol and 1 without) and food pairing (amuses bouche / finger food from Casa do Lago and Casa Velha) with live music - €150 per person – 44 seats available in 2 flights. 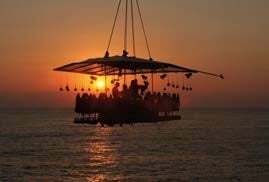 Dinner in the Sky: Dinner inspired by the kicthen of Casa Velha and live music - €250 per person – 12 seats available in 1 flight. 21:30pm to 23:00pm –one flight only! Secure your reservation now by calling (+351) 289 390 700 or by sending an email.